MANKATO, MINN. (February 7, 2019) – Greater Mankato Growth, Inc. (GMG), which includes the four business units — Greater Mankato Growth, Visit Mankato, City Center Partnership and GreenSeam — will host a reception celebrating President & CEO Jonathan Zierdt, considering his announcement of resignation from the organization as of March 15, to begin his next adventure. 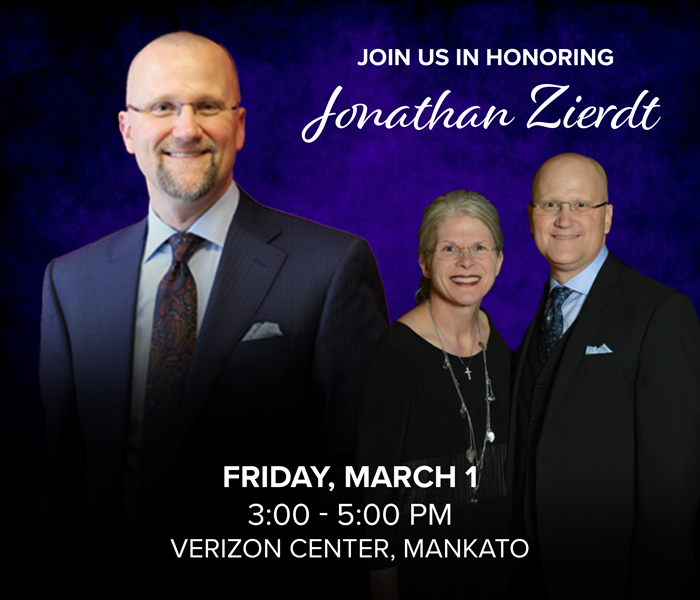 The public is encouraged to join us in honoring Jonathan for his accomplishments as well as his community and regional impact on Friday, March 1, 2019 from 3:00 – 5:00 pm at the Verizon Center, 1 Civic Center Plaza, Mankato, MN. The staff of GMG invite everyone to honor and share in this day as we wish Jonathan Zierdt the best in living every day to the fullest. We will share stories, browse photos and express our gratitude for this person who has made a difference and touched so many of our lives. A cash bar and appetizers will be provided. The event is open to the public. Please let your presence be your gift.